Today the Oxford English Dictionary announces the launch of OED Appeals, a dedicated community space on the OED website where OED editors solicit help in unearthing new information about the history and usage of English. The website will enable the public to post evidence in direct response to editors, fostering a collective effort to record the English language and find the true roots of our vocabulary. 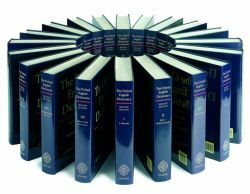 When researching and revising entries, OED editors use our famous citation files, gathered over more than a century, as well as electronic databases and corpora. Nonetheless, we sometimes find ourselves stumped when tracking down the very early uses of a word. Sometimes the trail runs cold earlier than we expect; in other cases, the ultimate origin of a word is shrouded in mystery. OED Appeals continues our long tradition of asking the English-speaking public for help in recording the origins of our vast, ever-changing lexicon. After all, when it comes to the words we read, write, speak, and hear each day, every one of us is an expert. The OED has been a collaboration between lexicographers and the public since its earliest days, from the appeal issued by the Philological Society in 1859, to the television programme “Balderdash & Piffle,” broadcast in 2005 and 2007. OED Appeals continues this tradition by using the reach of the web and social media to connect lexicographers with those who may hold hidden clues to word history without even realizing it. The first example of baked Alaska might be hiding in a forgotten cookbook on your bookshelf; your high school year book might hold the first evidence of the phrase in your dreams. Our goal is to leave no stone unturned in our search for the earliest evidence of each word included in the dictionary. Can you help us? Each week, as OED editors go about their daily work of revising and researching entries, they will be posting new appeals for evidence on specific words. You can keep abreast of the latest requests by visiting the Appeals home page, or following @OEDonline on Twitter. Can you help us find documentation of these words’ earliest history? Happy hunting! The Oxford English Dictionary (OED) is widely regarded as the accepted authority on the English language. It is an unsurpassed guide to the meaning, history, and pronunciation of 600,000 words— past and present—from across the English-speaking world. As a historical dictionary, the OED is very different from those of current English, in which the focus is on present-day meanings. You’ll still find these in the OED, but you’ll also find the history of individual words, and of the language—traced through 3 million quotations, from classic literature and specialist periodicals to films scripts and cookery books. The OED started life more than 150 years ago. Today, the dictionary is in the process of its first major revision. Updates revise and extend the OED at regular intervals, each time subtly adjusting our image of the English language. My husband is sure he heard “Blue arsed fly”early on in his Air Force career= 1949 -1969. His first tour of squadron duty -1951-52 was to RNAS Hal Far Malta, a naval air station. We believe Prince Philip was there with the Med. Fleet during at least some of the time. Sorry, no written evidence. As a little girl, in the early 50’s, I loved a game called “Cootie” which consisted of plastic parts that made up an insect-like creature, the Cootie. This fits with the above video re. the meaning of “cooties” in No. America (I grew up in Detroit, Michigan). I also grew up with “cootie catchers”, paper origami-like creations. You can Google either ‘cootie game’ or ‘cootie catcher’. I also remember putting “cooties” together in the 1950’s. In addition, it was common to run from someone who you thought had “cooties.” “Yck, (name) has cooties!” was a common refrain of children.